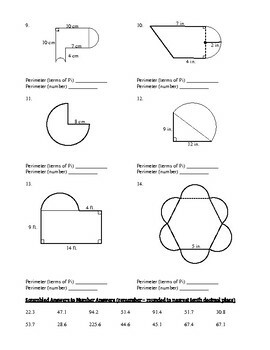 This worksheet is designed to give students practice in finding the perimeter of different compound shapes and writing the answer both in terms of Pi and as a decimal rounded to the nearest tenth. Many students have practice writing answers as a decimal (using 3.14 for Pi), but they have difficulty when asked to leave their answer in terms of Pi (something that is required of them on the SAT/ACT and other standardized tests). Leaving answers in Pi form is actually a more exact answer as you are probably aware of. 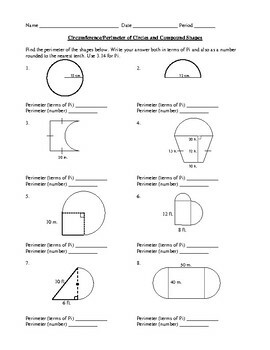 This worksheet has them doing both, and in some cases they have to combine Pi terms to get a single Pi answer. Another troublesome spot I see for many students is finding the perimeter of different shapes when they are combined together. They don't know where to start or can't differentiate between the shapes/outside lines and the inside lines that are not part of the perimeter. One of the things I have them do is come up with a plan for each problems before trying to solve it. they have to list all the shapes or lines that they are going to be adding. Next, they list the formulas for each and finally they add the different shapes. 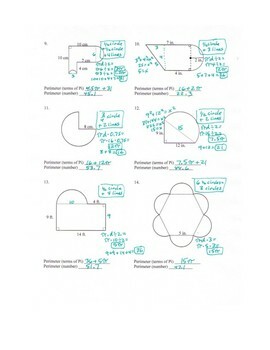 I have included an answer key for this worksheet. One thing I decided to do after printing the answer key was to add scrambled answers to the end of the worksheet so students can check their work as they progress through the worksheet. The scrambled answers are for the number answers only. 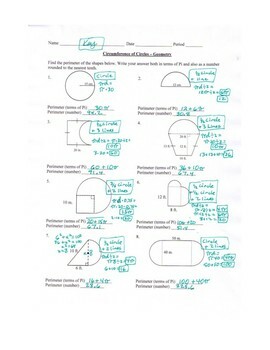 This worksheet uses some of the same shapes that I use on my Area of Circle worksheet - students are again asked to write answers in terms of Pi and as a decimal, but this time they look at the area of the compound shapes.